Most Comfortable Fishing Chair - The Perfect Seat for 2019! Nothing makes a long day of fishing better than a comfortable chair to enjoy while relaxing to the sounds of nature. Ice fishing chairs come in many different shapes and sizes, with many different options. Wouldn’t it be convenient to be able to carry your chair over your shoulder, or even better to have a chair that you can use for extra storage? What we need is the most comfortable fishing chair. I bet you didn’t know that there were so many choices when choosing a chair to meet your needs. The following list is compiled with 5 of the best ice fishing chairs for you to consider before making your final decision. New to fishing? Get our picks for the best beginner fishing combo! This extra-large chair is built with a rugged steel frame and is designed to support up to a 350- pound weight capacity. Constructed with a breathable, moisture wicking fabric, and padded armrests for additional comfort, this chair can be enjoyed for long periods of time. KingCamp brilliantly added a convenient side table with a drink holder on one side, and an insulated snack cooler on the other side. Imagine having everything you need right at your fingertips. You will find that it can be opened and closed in a snap, it is easy to use, and convenient to store. This chair is complete with a next to perfect rating and a valuable price, making it an excellent choice to add to your ice fishing necessities, or as the most comfortable fishing chair you’ll have. This lightweight, sturdy chair is constructed from a strong steel tubing that is easy to fold up and carry with you anywhere you go. This simple chair offers a triangular design that makes it easy to use for ice fishing, jig fishing, or any other sport you desire. The complete height of the chair is 30 inches, and the seat height is 16.5 inches, so you can see why this chair is so versatile. 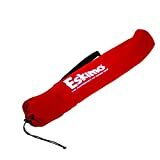 The Eskimo folding ice chair comes with a convenient travel bag, a high rating, and an affordable price, so with that in mind, why wouldn’t this be one of the best ice fishing chairs you can buy? The durability of this chair comes from the 19mm steel frame design that permits a 300-pound weight capacity. Constructed with the ice fisherman in mind, this Earth Products chair provides a high back padded backrest for added support, and a built-in storage compartment that was conveniently installed below the seat. 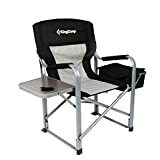 This lightweight chair folds up, and can be placed into a full-sized pouch, while the convenient shoulder strap will make it a snap to carry along with your other gear. It’s one of the lightest and most comfortable fishing chairs you’ll find. This chair offers a high rating at an economical price. Seat 11' x 12" Overall Height 31"
The smart design of this chair is perfect for fishing! A 1 inch premium foam padding covers a plastic swivel, folding seat, and is thick enough to make a long day more bearable. The seat sits on top of a convenient compartment with an insulated foam cooler, and if you would rather use it to carry your gear, that is no problem because the foam insert is removable. Complete with a shoulder strap, an almost perfect rating, and a great price, how could you go wrong with this choice? Now that you have had the chance to explore your options, you should be able to choose the most comfortable fishing chair that meets your needs. You might want to get two so you can take a friend along on the trip!